White Sage, Salvia apiana, is a ceremonial herb of the North American Indians. The white leaves are burned to cleanse the spirit and welcome positive thoughts. White Sage is native to southern California and Mexico. Prefers light, dry, well drained soils, in an open sunny position. Clusters of lavender to white flowers from spring to summer. Drought and frost resistant. Perennial plant to 1m x 1m. 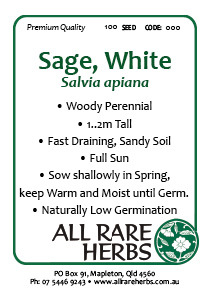 Note: White Sage has naturally low germination rate, usually 5-10%. Germination can be slow, up to 30 days and is ongoing for another 30 days. The seed offered is fresh from last season and achieves high germination rates, for this species. Be the first to review “Sage, White seed” Click here to cancel reply.